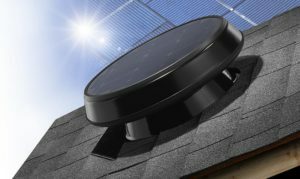 Protect your home from heat and moisture damage with a solar attic fan from Byers. During the day, warm, humid air accumulates beneath your roof. Without proper ventilation, this moisture encourages wood rot and the growth of harmful mold and mildew. High humidity levels can also damage insulation and corrode internal wiring. That’s why it’s important to have a reliable mechanism to rid your home of hot, damp air. At Byers, we can install a Solar Star solar attic fan at your residence, usually in a single afternoon. Solar Star is a division of Solatube®, the leading manufacturer of solar-powered attic ventilation systems in the nation, renowned for producing sleek, durable, and reliable products that provide green solutions for environmentally conscious homeowners. Solar Star offers a number of solar attic fan models that are well suited for any roof. You’ll be able to choose from low profile, high profile, and pitched configurations. During an initial, consultation, one of our specialists will provide all the information you need you choose the one that’s right for you. We’ll also evaluate your home’s orientation and the tree canopy around your residence to determine the best location for your solar attic fan. In addition to protecting the structural integrity of your home, a solar attic fan can lower your utility bills by making it easier for your HVAC unit to keep inside temperatures comfortable during warm months. What’s more, your fan will qualify for a 30-percent tax credit, saving you even more on the cost of your home improvement project. To learn more about having a solar attic fan installed at your home, contact Byers today and schedule your consultation. We also offer financing for qualified homeowners.